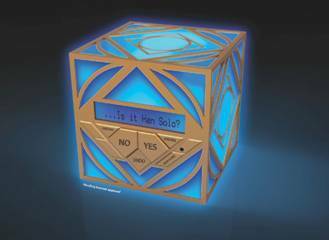 Uncle Milton, the company that creates some unique and fun Star Wars toys based on science, is creating a Jedi Holocron toy based on its 20Q system. The best part is that they want Star Wars fans to play a part in creating the game. Click on the link below and play the Star Wars 20Q game. I tried it myself with Ahsoka Tano as the test subject and it guessed correctly. It wasn’t exactly the most difficult test but at least it got it right! I’m guessing Uncle Milton will be using these responses and interactions as a basis to build the Holocron response system. It’s potentially a great way to expose more kids to Star Wars and science, and a cool way for Star Wars fans to play a role in its creation. Be sure to check it out and to visit Uncle Milton next week at Star Wars Celebration Anaheim! STAR WARS FANS BEING ASKED TO TEST JEDI KNOWLEDGE AGAINST THE FORMIDABLE 20Q ARTIFICIAL INTELLIGENCE! GO TO http://starwars.20q.net/play AND PLAY!! !